Shepherd shelter Chowari Jot to Dainkund trek. Looking over Chowari - Lahru valley. This quote sums up Chowari Jot - Dainkund trek for any aspiring trekker. 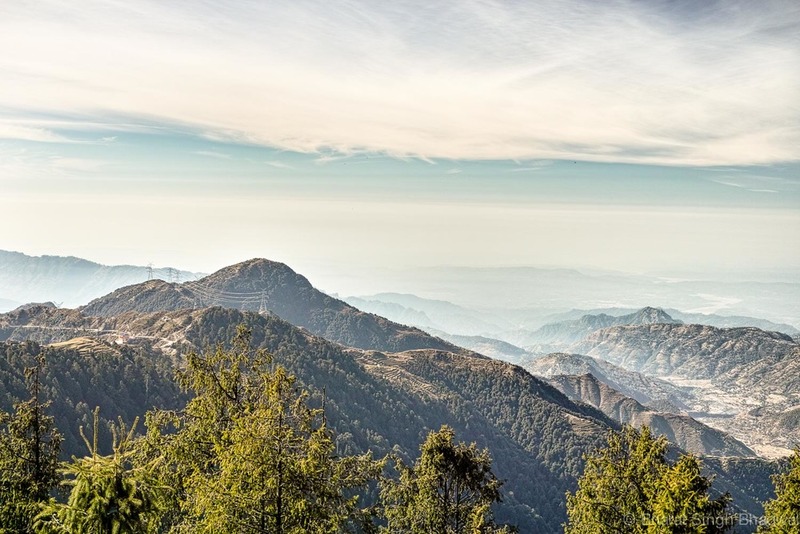 No trail around Dalhousie and Khajjiar affords such majestic views of the Himalayas throughout the journey. 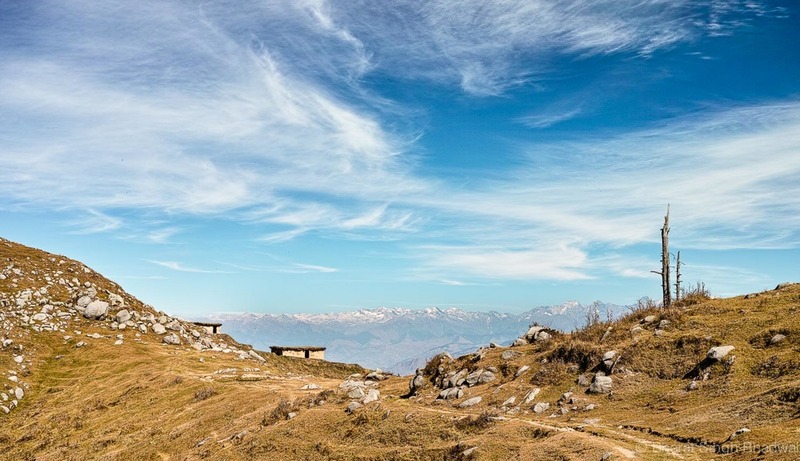 Chowari Jot and Dainkund are linked via a 6 kilometre ridge that undulates between an elevation of 2450 and 2750 metres above sea level. 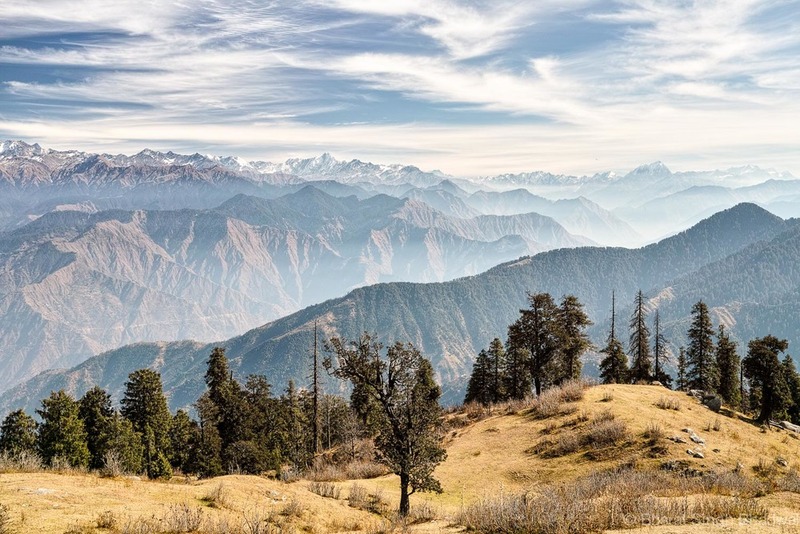 The motorable road on the other hand, dips down steeply to Khajjiar from Chowari Jot and then rises to Dainkund, a total distance of around 30 kilometres. Walking along this ridge provides unparalleled views of Pir Panjal and the Middle Himalayas. This route is frequented by locals as a faster than bus alternative route to Pholani Devi temple and by shepherds grazing their livestock. This day trek is an excellent trail for a day out with children, family and friends. The trail starts at the viewpoint the overlooks the car parking at Chowari Jot. From this viewpoint, the trail meanders along the various viewpoints dotted along the Chowari Jot ridge. After the viewpoints the trail passes along an ugly mini concrete dam. This Frankenstein dam was created by HPTDC (Himachal Pradesh Tourism Development Council) to promote tourism (sigh). After the dam, the trail follows the ridge in a northerly direction over several grassy meadows. About two kilometres from the starting point at Chowari Jot the radars at the airforce station in Dainkund are visible on the horizon. From this point onwards, the trail is dotted with numerous small ponds, shepherd shelters, viewpoints and prospective camping grounds. Be advised that these ponds do not contain potable water, and they are generally used by shepherds for watering their livestock. Pond along Chowari Jot - Dainkund day trek. Four and a half kilometres from the start the trail meanders into a long winding left hand turn. A small shepherd shelter along a pond immediately after this turn is the best viewpoint and picnic spot on this trail. After the shepherd shelter the trail passes through a grove of trees and emerges near the Pholani Devi temple at Dainkund. From the temple, you may choose to continue to Dalhousie, Khajjiar or on to the vehicle parking at Dainkund. A small budget hotel is situated at Chowari Jot. A couple of restaurants sell simple home cooked meals and a licensed wine shop sells Old Monk. HPTDC viewpoint shelters make excellent sheltered camping area. An easy trek with no steep ascends or descents over a well defined mule trail. This trail is visible on Google Maps. Pleasant during the day till from March to November and very cold at night. Caution - No potable water along the route. Ensure that you carry adequate potable water. It can get very cold at night. If you are planning to camp overnight, make sure to carry enough warm clothes.